While I didn't say much during those next 15 minutes, I remember listening to the conversation happening between Brett and those O-linemen and thinking to myself, "These are just regular guys." It was a great way to be introduced to the NFL and helped me understand from an early point in my career that underneath the fame and success that the NFL could bring - we were all just regular guys. I remember the first game that I started in the NFL. It was the fourth game of my 2002 rookie season against the Carolina Panthers. Our starter, Vonnie Holliday, had gotten hurt. Even though as untested fifth-round draft choice, I had earned enough of the trust of the coaches for them to let me step in and fill the void while Vonnie got better. The very fact that the coaches believed in me, particularly Ed Donatell and Jethro Franklin, made me feel valued and reinforced my belief that I was capable to get the job done. We were a good team, a Super Bowl contender, so I didn't want to let the team down. I remember studying the game plan really hard. I also spent a lot of time breaking down film of the right tackle I would be playing. His name was Chris Terry and he was the biggest tackle I had ever played up until that point in my career. It was a home game at Lambeau. The weather was perfect. It was a sunny and blue skied day with a slight breeze in the air that let you know autumn was coming - football weather. For those who have never had their name called to represent the storied franchise of Green Bay, suffice it to say that my words will not adequately describe the unique feeling of pride and responsibility that comes with representing the Packers as you run out of that tunnel. It was a very special feeling that I will not forget. My emotions were brimming at a fever pitch, I was ready to play. While I don't vividly remember any particular plays from that game, I do remember that after we left the field victorious and I personally had displayed a strong defensive performance, that I solidified in my heart and mind that playing in the NFL was something I could do and do well. 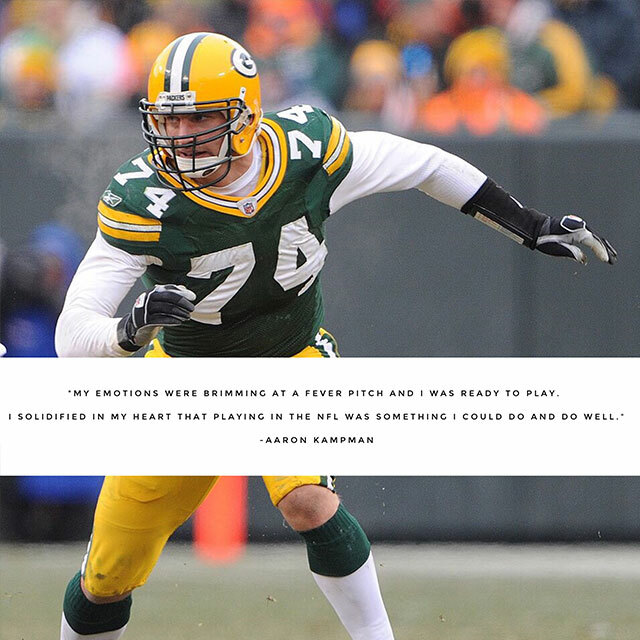 It was a tremendous way to begin my NFL career. It was April 2002. I had just been drafted by the Green Bay Packers days before. I was sitting inside Lambeau Field at a breakfast table for the post-draft mini-camp that was supposed to begin that day. This was back when the whole team would come back for mini-camp in April. This meant that all the veterans would be back in town for the weekend to start preparing for the new season. I was early, and I was nervous. I was one of only a handful of young players that were sitting there in the makeshift breakfast room (it was actually a gym with tables and chairs). I remember sitting there and being deep in thought about how I was going to fit into this new team. I must have been so preoccupied with my thoughts that I didn't really notice that someone else had entered the room and was getting ready to sit right across from me. As the chair across me started to move backward I shook from my own thoughts and actually looked up to see who was coming to sit down. It was Brett Favre! I remember putting down my head again right away to not show how shocked I was to be sitting across from such an accomplished quarterback. We proceeded to eat in silence until some of the veteran O-line came in a few minutes later and sat down next to Brett.